This portrait, painted in 2015 was taken from a clear school photograph and displays some delicate skin tones as well as intricate detail within the hair. Portrait painted in 2015 on Canson pastel paper. Image size 8" x 11"
Some gorgeous shades going on through the hair on this one. A great study to do. 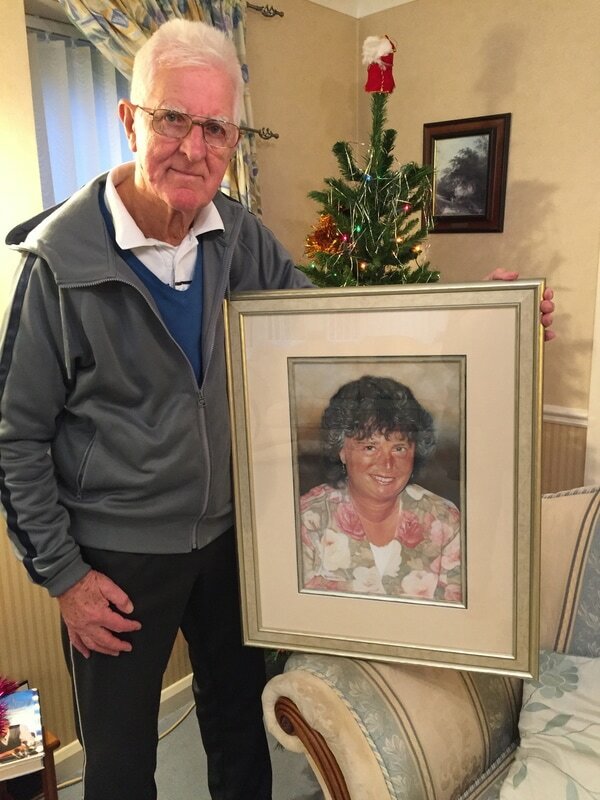 Roy commissioned me to do this portrait of his dear late wife Wendy so that she would always be there to greet him when he came into the lounge. He was overwhelmed with her likeness and couldn't have wished for a lovelier Christmas present. 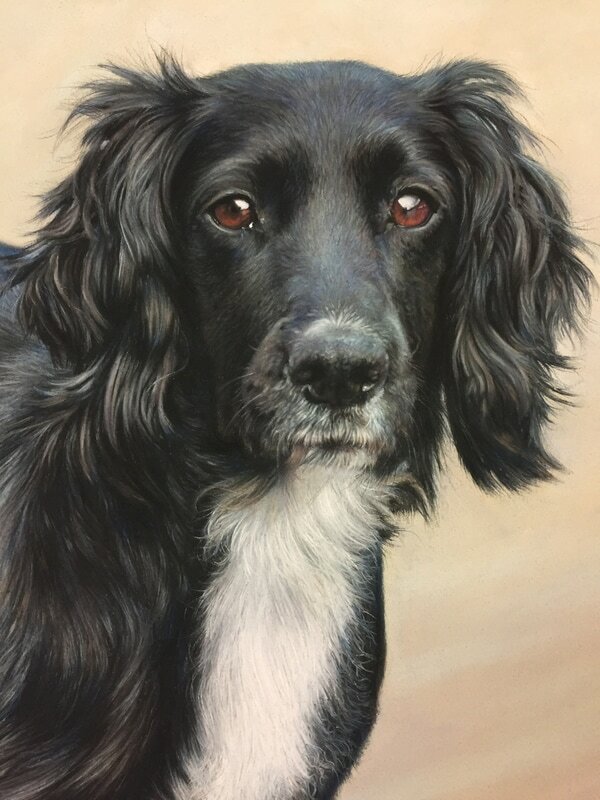 My 'Pippa' Portrait was commissioned by a very devoted wife for her husband as a surprise for his 50th birthday. The challenges with lots of black fur is to make sure you always use a cool underpainting such as a blue or purple/magenta. This way, when the black chalk goes on over the top, these beautiful hues will pull through when doing the fine detail. Work in progress before blending or fine detail. Shadow was a delight to paint. Lots of great underpainting and cross over fur made for some great detailing challenges. When painting lighter coloured dogs, the key is to make sure you get your 'darks' dark enough for the highlights to stand out. This was an amazing portrait to work on which took me almost 3 months to complete. It is a combination of the subjects life from his London home in a town house in Folgate street and his bedroom in Colchester Essex where he stays with his Father. A talented musician and PR for a classical recording company, his treasures were somewhat interesting. The view from the window was of where he would ultimately like to live in Suffolk but he actual window was from his London house (pictured in the photo behind his left shoulder). He collected paperweights and many small toy cars but the Lincoln behind him was from a photo of his real car. When I did the photoshoot with him, he was constantly on his mobile phone so it seemed appropriate for him to be looking at it in the painting. Quintessentially British, he loved history, old masters, old films and buildings and books. He also loved flowers...and his gin and tonic!